For the best patio cover selection available to homeowners in Bernalillo, New Mexico, or any of the surrounding communities, turn to the experts at ABC Seamless of Albuquerque. We have been the area’s leading home improvement contractor since 1989 and can provide you with the products and quality of installations that you desire. Our patio covers are a great way to enhance your home with extra shading so that you can enjoy your backyard like never before. 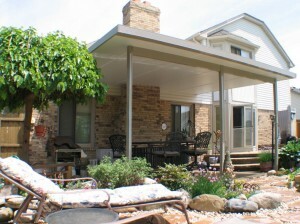 And, should your needs ever change, our patio covers can easily be converted to room enclosures down the line. Quick turnaround time – Our covers can be installed in as little as one day so you can enjoy your new backyard retreat as fast as possible. Low-maintenance requirements – The patio covers we offer are made with baked-on enamel that allow them to hold paint nearly three times as long as real wood. And, our patio cover selection is available in a large variety of styles so that you can ensure that your new installation will match the current look of your home’s architecture. For more information about the benefits of installing a patio cover at your home in Bernalillo, NM, or a surrounding area, contact ABC Seamless of Albuquerque.